How to use client management? 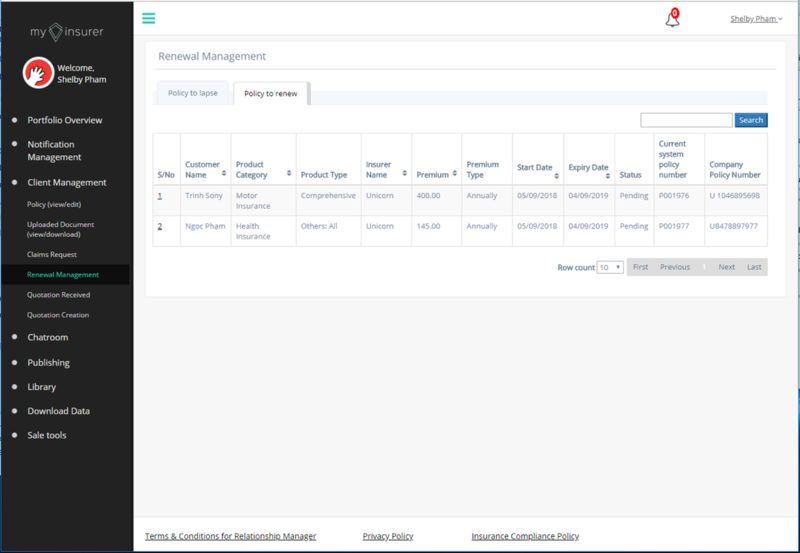 Policy Management allows you to have an overview of all the policies you have in the system and the respective policy details. 1. ​What is the purpose of the "Policy Management" tool? You can have a convenient view of all the policies input in the system. You can further sort the policy data you wish to retrieve and view. 2. Can I filter the information I want to view? Yes. 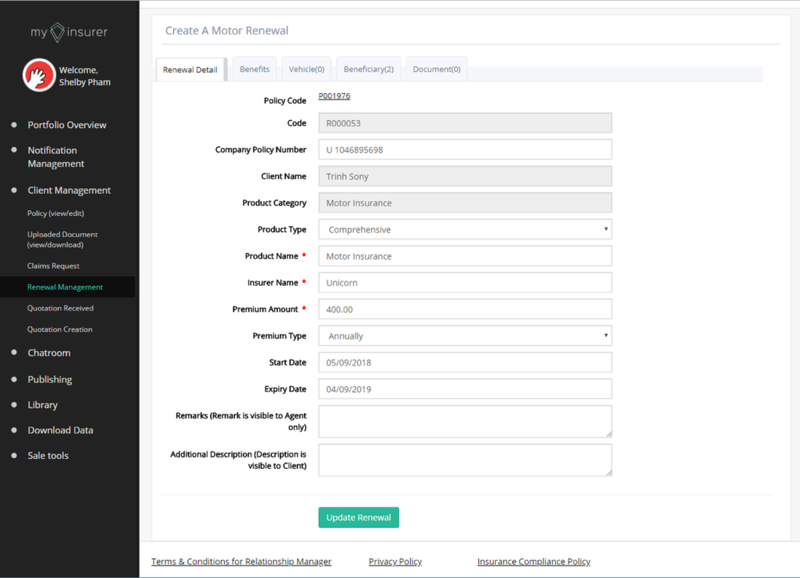 You can filter the information by Customer Name/ Policy Number/ Company Policy Number/ Product Category/ Product Type/ Insurer Name/ Premium/ Premium Type/ Start Date/ End Date/ Status. 3. Under "Status", what does it mean when a policy is "deleted"/"effective"/"expired"? 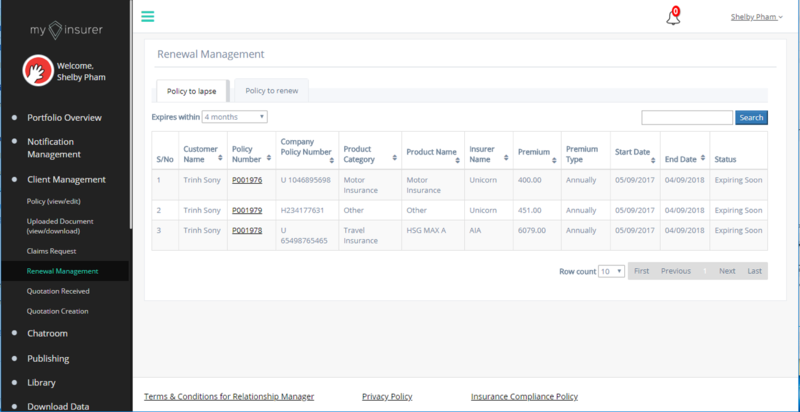 A deleted policy is 1 that has been removed from a customer's profile but can still be viewed in the Policy Management tool for agent's reference. An effective policy is 1 that is incepted and in force. Expired policies are ones that have lapsed. 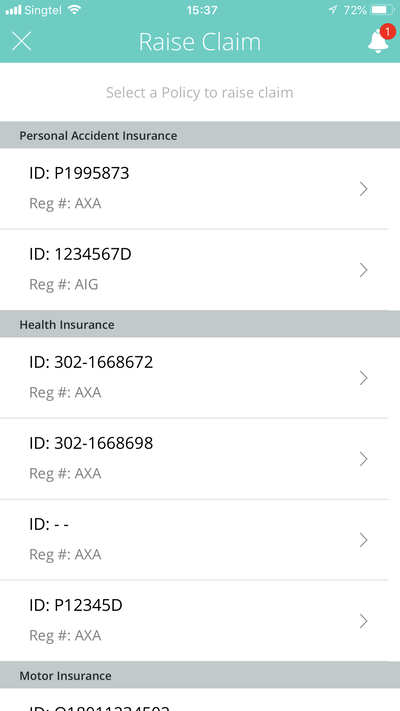 my-insurer do not shoe expired policies in the client's mobile app. 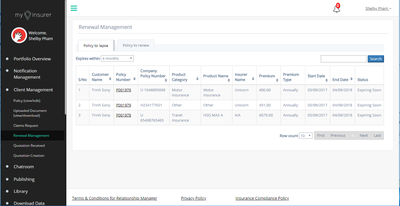 Agents can refer to expired policies in the Policy Management tool. 4. 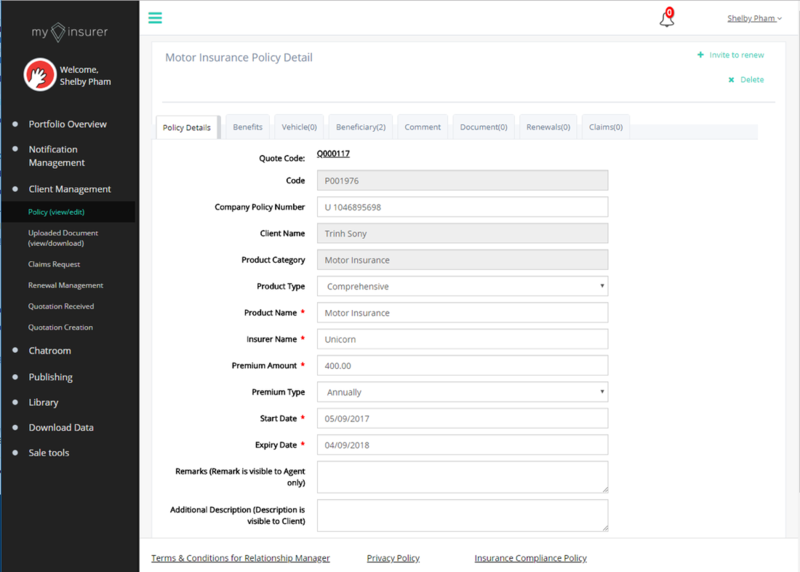 How to create a policy to a client? On the menu bar, click on "Portfolio Overview" > "Client" > "Create a new account"
5. How to allocate a product to a client? On the menu bar, click on "Portfolio Overview" > "Client" > "Create a new account" > "Client's Name" > "Create a Policy"
6. How to edit a policy? On the menu bar, click on "Portfolio Overview" > "Client" > "Create a new account" > "Client's Name" > "Policies" > "Policy Number" > Edit Policy > "Update Policy"
7. 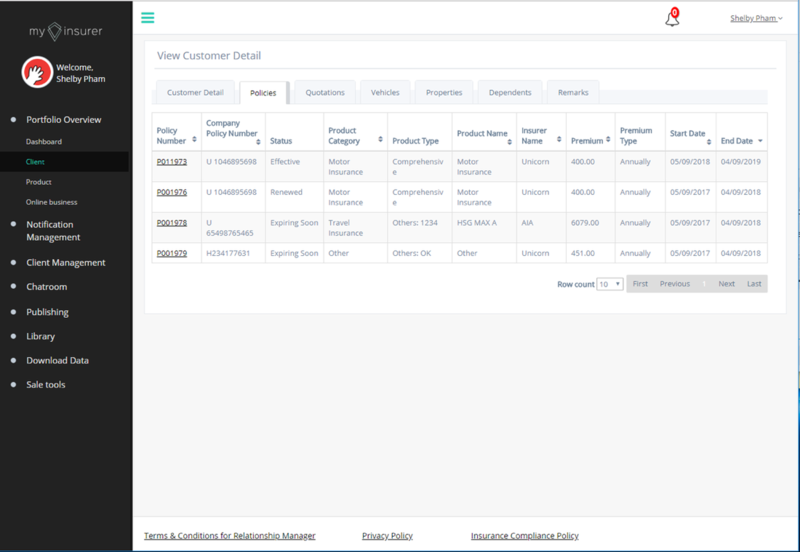 How to allocate a product to product library? On the menu bar, click on "Portfolio Overview" > "Client" > "Create a new account" > "Client's Name" > "Create a Policy" > "Save to library". Uploaded Document allows you to manage the documents that has been by the client via the mobile app. 8. What kind of documents are parked here? Documents sent to you by your client via the app as well the diagnostic report generated by our KYC sales tool will be parked here. 9. What is "Document No."? Document number is a number assigned by the client when naming the document. It is not a mandatory field in the client's app. 10. What is "Document Title"? Document is the file name assigned by the client when uploading the document. 11. What is the difference between "Date Created" and "Date Modified"? Date created is when the document is first uploaded. Date modified is the date when the document is most recently modified. Claims management allows both agent and client to track the progress of the claim. 12. Can my client actually make a claim to the insurer directly from my-insurer? No. 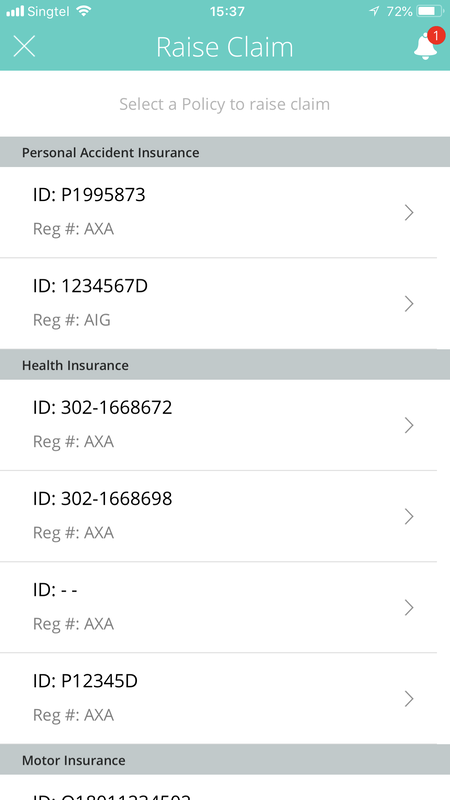 The claim management tool on my-insurer is only a tracking tool. To submit an effective claim, please kindly do so on the insurer's appropriate channel. 13. 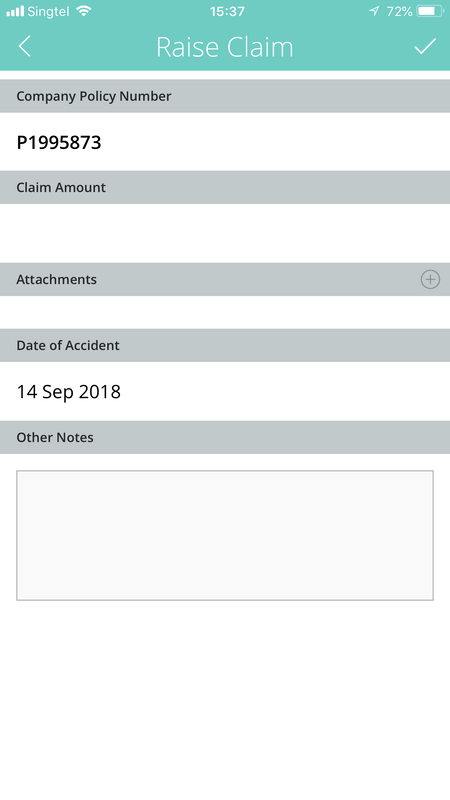 What is the purpose of "Claims Management"? 14. I see a "Claims Status" function. Is it automatic? Or will I need to manually update it? You will have to manually update it. 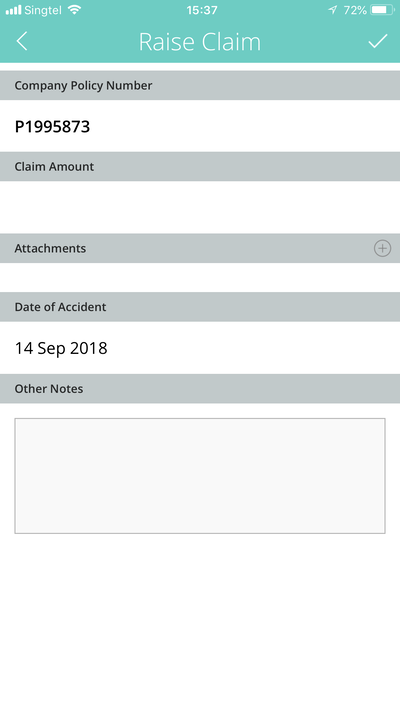 You will be solely responsible to update the status so your client is keep aware of the claims status through the app or email notification. 15. What is the difference between "Remarks" and "Comments" ? 16. What is the difference between "Policy to lapse" and Policy to renew"? 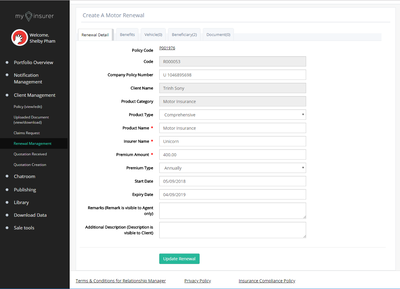 The policy for which all benefits to the policy holder cease and is terminated due to non payment of premium amount on the due date or even after the grace period is called a lapsed policy. Policy to renew refers to policies that policyholders can renew to enjoy the same set of coverage . 17. I created a renewal under "Policy to lapse" but i still do not see the renewed policy in my client's profile. Why? After creating a renewal under "Policy to lapse", the renewal falls under "Policy to renew". 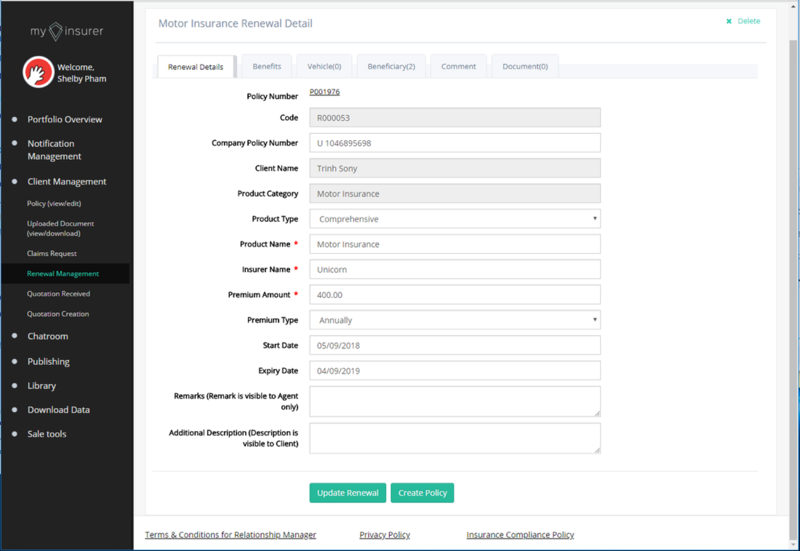 To add this renewal to a client's portfolio, you are require to create a policy from the renewal list. 18. What does the same policy appear twice in the client's portfolio? We only show the effective policy on the client's app. Whereas in the agent system, we keep track of the policy "transactions" ie we show agents the number of times a policy has been renewed. The module allows you to manage all the quote requests submitted by your clients via the app; as well as the quotes you have sent; and the status of the quote. How do I create a quote when I receive a quotation request? Overtime, I have create many quotations, how do I sort them? 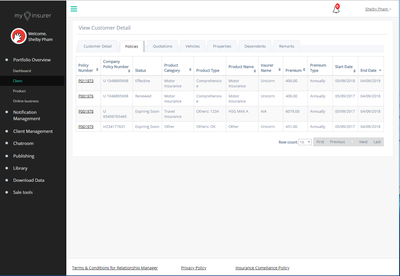 You can sort them by the quotation code, client name, product category, product name, insurer name, amount quoted and date quoted. What are some of my fields highlighted in grey? How do I get rid of them? Once you click on the fields, the highlights will disappear. What do the status "Pending"/"Accepted"/"Accepted and Created"? and "Declined" mean? ​Pending means the quote has been successfully sent to the client, and awaiting their response. Accepted means client has accepted the quote, and is awaiting for the agent to add the policy to the client's profile. 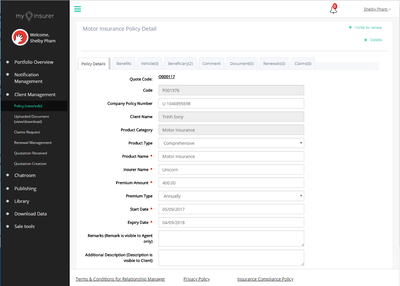 Accepted and Created means the policy is added to client's profile. Declined suggests client has rejected your quote.